Bermuda…. one of the prettiest islands in the world, with friendly people everywhere, justifiably proud of their island’s bounty of beauty. My recent trip was both a relaxing and a grounding experience – I really found myself reconnected with Mother Nature during this voyage. However, it wasn’t only the white sand beaches, the calm waves lapping on the shore and the perfect weather that soothed my soul…although that was all wonderful. 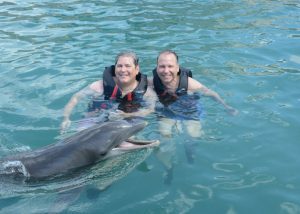 The best part of the trip was meeting a family of dolphins. 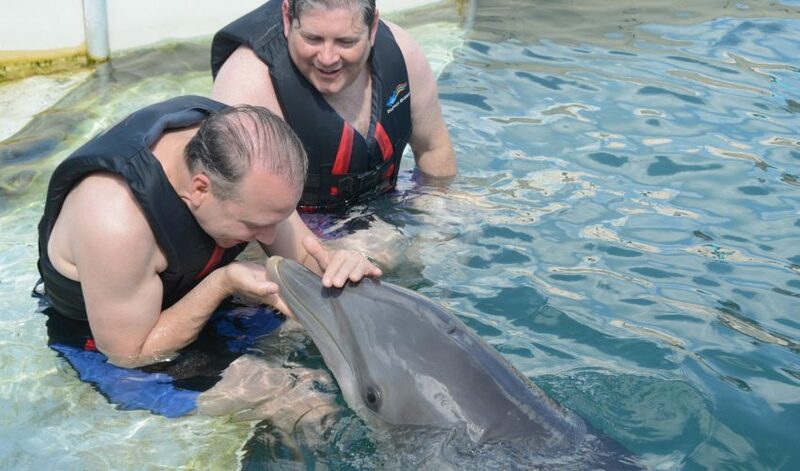 I fed them, swam with them, petted them, and even kissed one on the nose. 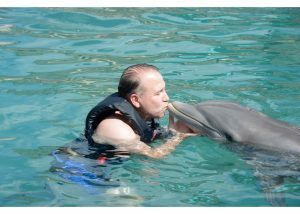 Actually, both my CEO Paul and I each kissed a dolphin…and we liked it! 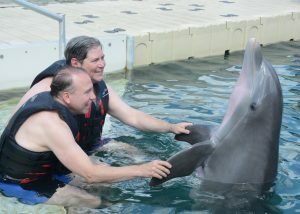 Our adventure, courtesy of Dolphin Quest Bermuda, will remain the memory of a lifetime. Just being in the water with them took my breath away! I was glad I wore a flotation device. The lovely and docile mammals let me “shake” their flippers, rub their bellies and in return, they talked to me in squeaks and chirps and smiled as much as we did! It was aMARzing, humbling and exhilarating, all at once! I found myself grinning for the rest of the day. In the wild, a dolphin will live about 16 years, but in captivity, because of the regular meals and lack of predators, they can live four times that. 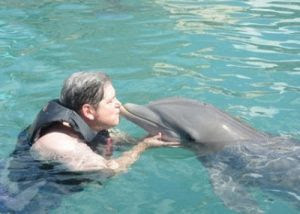 Having a family of dolphins to study allows Dolphin Quest to fulfill its missions of conservation and education. The Bermuda location is one of three worldwide and is associated with well-respected marine scientists, environmentalists, and educators. All support scientific research that helps identify solutions to challenges facing all marine species, not just dolphins, and the fragile ecosystems in our oceans. The money from the experiences helps fund responsible activities to educate the public, strengthen their connections to marine life, and inspire future generations of aquatic stewards. Touching these beautiful animals and spending an hour in their environment only validated what smart and kind creatures they really are. I could see the dolphins looking right at us; acknowledging our amazement. They weren’t proud per se, just aware of themselves in a very calm and refined manner. In return for our admiration and happiness, they gazed into our human faces, as we all floated in the water together, and loved us right back. Life is good even better when you kiss both someone you love and something you admire.